One of the features of the new bus network is that in return for a much greater number of frequent routes, some people will need to transfer. It’s important that we make that process as easy as possible, especially at the major interchanges – like the Panmure one that Luke posted about this morning. 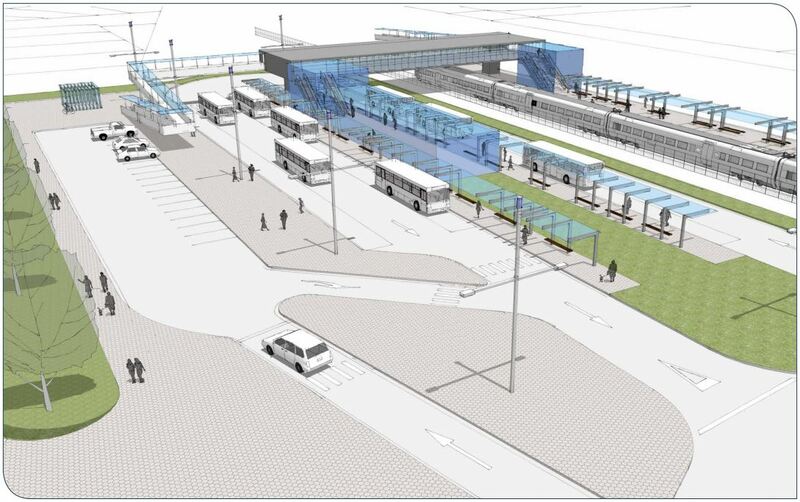 In South Auckland where the new network has already been consulted on – and received really positive feedback with something like 70% support – one of the biggest interchanges will be at the Otahuhu train station where there will be two frequent and numerous other bus routes. The the current situation is fairly grim with the station being hidden from the main road by walls of empty shipping containers, there’s not even really any bus stops nearby. Here are some images from Auckland Transport of the station and it’s surrounds as it is today. I really like the idea that there will be an enclosed waiting room for bus passengers. That’s something we haven’t seen be a feature in Auckland so far so a nice addition. Here are some images of the proposed upgrade. If the final design turns out like this then I think it will be quite a neat station. I really like the wide concourse building and the close integration with buses. Certainly a much better use of the land than what is currently on the site. If this is the standard for the major interchanges – which it must be considering other major stations like New Lynn and Panmure – then I think it suggests we are heading in the right direction. If I was to have one concern about the project though it is that it focuses only on the interchange, why not also take the opportunity to upgrade the local roads to improve walking and cycling connections for locals but that is something that can be included in the feedback. Enclosed waiting rooms for bus passengers are at (almost) every Northern Busway station? 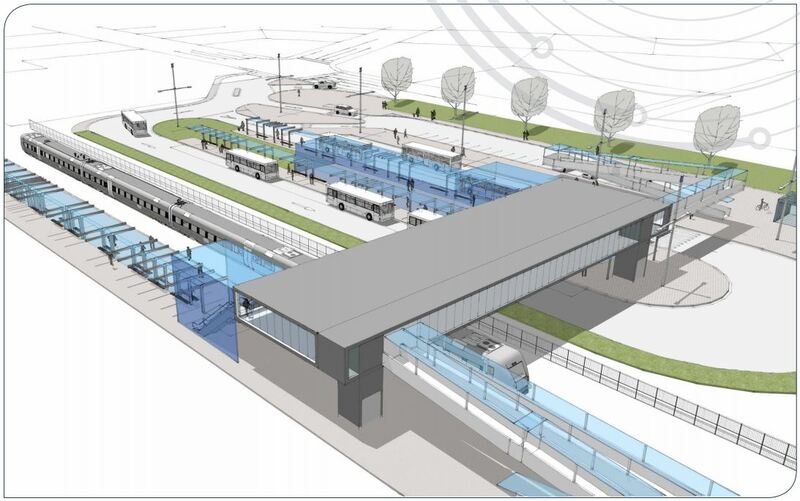 In fact this whole thing looks quite a lot like a Busway station (which is awesome). Nice design. I bet that massive pedestrian bridge will be the first thing cut from the initial design and they will retain the existing old wooden bridge as a “interim” measure that will still be there in 10 years time. I hope the car parks are for Kiss and ride use? Also lets think about some joined up cycle storage as well – ATHop linked cycle room or better still a bike storage and repair shop. Yes although what’s the bet they will be for staff too. Thoughts: There’s a lot of barren empty space there. If you cut the carpark down to a decent pickup/dropoff on the kerbside, and ditched the giant traffic islands, you’d have space for a small commercial building that might activate the street frontage a bit. The glass roofs are also not going to be so fun in mid-February. How about something that can cast a little shade as well as keeping the rain off? Other than that, looks good. This, and being a hub in the new network, is going to be great for Otahuhu. The carpark is larger than the bus stop for christ’s sake!!!! Yeah, that car park is weird. Doesn’t work well for “kiss & ride” (no turning space, one-way dead-end aisle), and if its not kiss & ride, what is it for then??? It’s an interchange in relatively central, almost urban (in terms of building density) area in the southern part of Auckland (i.e. not at the fringes wher P&R may make sense) – it shouldn’t cater to car parking at all, that’s my view. As Steve D has pointed out, using land for this kind of low value thing comes with a high opportunity (and actual) cost! Yes. Otahuhu and the surrounding part of Mangere is an area which will see significant increases in housing and commercial density, even without the upzoning in the Auckland Plan. Unless of course a new motorway gets built through it. Even with a motorway. It will just be a much less pleasant place to live and do business. I’m not convinced. Saleyards is a busy intersection, and is being loaded with more traffic by trucking companies. While I don’t mind that buses are being given more priority, that intersection is going to mean a lot of waiting for all modes. Something else about this big turning bay doesn’t sit right, but I can’t work out what it is. This is a massive improvement on any transport infrastructure in Otahuhu – I was in the Otahuhu bus station on the weekend, and it has not been touched since the 1980s. It is a museum to historic design. I might go back and take some photos for a guest post soon. Not touched since the 1980s? Not true! After an assurance from the Mayor that ‘something would be done’ about the Otahuhu transport centre, someone bustled out, repainted the seats (they used to be red, remember?) and removed the shelters. Then I suppose the Mayor got distracted and everyone else lost interest. Yes, I do remember the red seats! I can’t see this working at all. Otahuhu is poorly positioned to just about everything. Better to put a transfer facility at the old Mangere station site. Otahuhu was there as the principal service station to the rail workshops, Challenge fertiliser Dominion Breweries and a few others. Nearly all these industries are gone now. Ah, yes, the current Otahuhu train station is a bit of a star, isn’t it? And this is after the recent upgrade. Still, if you want to see really third world PT amenities, you’ll have to walk up the road to the Otahuhu transport centre. I understand the new design is based on the northern busway stations, and covered seating with facilities and a coffee stand would be light years ahead of anything in this area at present. The big question is how the new bus/train system will work with the new motorway Auckland Transport and NZTA appear to want to put through about 1km to the south. There needs to be vastly improved cycling and pedestrian access, including disabled access, as part of any upgrade, and some submitters noted this. The diagrams don’t show whether this has been considered but again i understand that this was part of the initial plan. – it should double back on itself and come out near the bottom of the concourse building surely? They’ve got on such double back on the bus side of the concourse building in their design. Otherwise the users of this ramp will have to walk quite some distance away from where they alighted to access the ramp, or will have to double back quite a way to access the platforms. if you look at the earlier image – there’s actually escalators giving a much more direct route. The ramps seem to be there for mobility access only? And people who want to take their bikes on the train! I tend to use the escalators for that too! Tighten both brakes and hold on… not perfect, but works. I am impressed! This looks fairly world-class. There is a slide in the AT stuff that suggests they will look at local road connections. For example if made a pleasant walk to town then some people will happily walk the 800m, or 500m to recreation centre and soon to be pool. Would be great to have some cycle routes to areas such as seaside park that will never have a reasonable bus service, but are within the 3-4km catchment radius. I suspect the Otahuhu centre interchange will disappear as a result of this, no buses will terminate there anymore. I think it is owned by NZ bus so they will be keen to sell it off if they can. I also saw in the plans upgrades to paths and surrounding roads. Where’re the containers going outta curiosity? Two concerns. Would love to see actual plans; is the entrance opposite Station Rd? Making a cross intersection, surely, makes sense. Kiss and Ride is designed as a carpark so will be used as such. Please design this for drop off only. The airport shows how to do it- and police it. Otahuhu is no place for Park n Ride. Needs radically improved walking [especially crossing and along Walmsley Rd] and cycling routes to Otahuhu and the nearby residential catchment as part of the work. Good ped crossing of the new intersection at Station Rd and Walmsley. Currently it’s hell getting across there. Footpaths are narrow and close to high volumes of speeding traffic. The overbridge needs to extend beyond the interchange and cross over Walmsley Rd. I always see pedestrians scarpering across the road like a game of frogger because they can’t be bothered waiting for the eternal crossing phase. Although it seems industrial there is residential in nearby Marjorie Jane Cres, with flats, boarding houses and a caravan park. All low income often with no cars. Currently they can’t even catch a bus to Otahuhu. They have to walk as there is no bus stop in the whole area. There needs to be bus priority lanes, as at rush hour the area is clogged. At the opposite end (Otahuhu shops) end of Station Rd, they should make it more pedestrian friendly, almost like a shared space, and divert through traffic another way. There is a primary school, doctors surgery and shop, with traffic speeding along and people trying to cross the road. But hey, it’s a poor area which is why it has been neglected for so long. Its also a poor area in the former Auckland City. Like Panmure and Avondale at the fringes of the city was totally ignored. Do you think this removes the signal box? There does not seem to be any commercial activity included. Putting a newsagent/sweets/coffee stall into a transfer station means that there are always some eyes in the area, reducing vandalism and hopefully, threatening behavior – the cancers of public transport. Such a shop could also be useful in giving refunds on travel cards…. I would expect that commercial activity would increase, as a matter of course, once the interchange gets built. Huge carpark and basically nothing that I can see for cyclists. Why isn’t AT building into these from the start great places to leave bikes and hence expand the reach of PT, why instead do they simply install a huge carpark that fits at most a dozen cars in a space that probably 1000+ bikes could be stored under a shelter with CCTV. Come on AT why do you hate cyclists and pedestrians so much? I delivered a bunch of these pamphlets yesterday about the open day Fri/Sat, there is the concern for a lot of the local businesses that they relied on the old bus interchange for a lot of their own income, and such businesses such as Mc Donald’s and the recently opened Carls Jr. are where they are because of the Interchange and the large amount of people that go by there everyday, this idea had been floated for quite a while hasn’t it? and I don’t think Carl’s Jr. would have built where they were if they knew there was to be a combined interchange hundreds of meters away. With that I’ve heard is to happen to the old bus interchange it is an interesting idea. Err, we should design the transport network around the needs of health destroying multinational business interests? I know you didn’t say that but it comes through in the ‘concern’. Any business that spends 300K? plus building a business they hope for a suitable return on that investment. I don’t agree with these type of businesses but they are a part of western consumerism. I would have raised the same point if Subway had built there or a perceived more healthier option to KFC/Mc D/Carl Jr etc. It isn’t just about the food businesses there, there are lots of ‘character’ shops which people visit waiting between buses where you can find some real gem items within 2 minutes of the interchange. It would be good at the new interchange that similar ‘character’ businesses do open up. You’ll have to attend the open days to really talk with the AT people about your point about retail at the station. Really it’s the same for any business. The Otahuhu town centre is too far removed from transport links and to combine them and drag commerce closer to this ‘hub’ makes good sense. Sure, there may be a bit of pain in the near future but we need to change this now. Things change and businesses will change with varying market conditions. It would be a great idea to do that, and extend development all down Station Road, but there’s clearly not been any effort to make that happen yet. The Unitary Plan keeps the area around the interchange as a light industrial zone, and there’s no development incorporated into the interchange itself. Which is a pity, but easily fixable: there’s huge amounts of wasted space in the design. The carpark layout, obviously, but also the huge traffic islands. I guess because there’s so much space there, that no effort’s been made to make a design that makes good use of space. Having the buses and trains together makes sense. I’m sure there can still be a stop for those who have to catch a but to get a burger :-). Maybe they could ride or walk from the interchange to pre-empt the added calories? Of course it makes sense and I am 100% for that, a shame I can’t attend the open days Friday and Saturday as I’d love to talk to the AT people in person about it. Well the old interchange is in doubt about still continuing as a bus stop at all and the landowner looks likely to sell to interests about bringing a bigger drawing point to Otahuhu. I agree with your last statement but if these bus/trains end up being co-ordinated more effectively in terms of timing people might not have that spare 15 minutes to walk there and back getting their order before their connecting bus/train arrives to head to their destination, I am not saying either that these businesses should anchor themselves close to the new interchange but these businesses can still be big employers for the area. Promoting the ‘right’ businesses to set up by the interchange is a must ones that can deliver services to bus and train goers and provide necessary employment for the local people. The frequency will be such that you can walk and get your heart attack to go and then come back to the bus stop, and eat the thing whilst Buses drive past because the last thing others want to smell on their commute is some feral burger from Car Jnrs. These businesses are irrelevant and have no character and certainly don’t bring anything to these commuties with their poorly paid jobs except diabetes and future medical bills and ill health. You can see from the map above that all bus services that stop at the train station will also stop at the town centre, and vice versa. Anyone transferring between buses from the east side would still be better off doing so at the town centre. To me the level of buses stopping at the town centre and the need to allow for transfers suggests that the bus interchange will still be needed regardless of what happens at the station end. As I expected. Thanks for the confirmation Matt. Actually in the brochure it says that the existing bus interchange will be closed and replaced by normal bus stops on the road, but this shouldn’t make things much harder for users especially if there is a pedestrian crossing. It’s pleasant cookie cutter design. I’d encourage the designers of such places to more concerned with rigorously minimising the interchange walk. Especially in cases like this where the place itself (I mean Otahuhu train station) is not an activity centre of interest, and probably a large majority of boardings (train and bus) will be transfers. For example: how much would it cost, in context of the total interchange cost, to build a new side platform for southbound trains? Then you run the buses clockwise through the interchange (not anticlockwise as proposed). Departing buses connecting off trains from the city pull up directly beside your new side platform. With barrier-free access, your bus does not need to be more than 10m from the door of the train, without change of level. If that’s too radical, you could still run the buses clockwise, with bus platforms between the buses and the rail fence, and that would save I guess 10-20 metres of overhead walk. And shouldn’t there be a road exit to Walmsley Rd at the south end of the interchange, near where the zigzag ramp is shown, to minimise the diversion for buses continuing to/from Walmsley Rd south? Rather than the proposed teardrop style dead end exiting only to Station Rd. Great to see such a proactive approach. If only we saw this with every project! While having the buses pull up on the rail platform sounds goood, that doesn’t provide enough “platform” length for all the buses using the interchange. Don’t forget, it is also for passengers transferring between bus services, not just between bus and train.